External indebtedness poses a risk to Indonesian businesses, and economic growth is slowing down further. Joko Widodo (popularly known as ‘Jokowi’) has won Indonesia’s July 2014 presidential election. In the political offices he has held so far, as mayor of Surakarta and governor of Jakarta, he has proved to be a successful reformer and fighter against corruption. Corruption, vested interests and resource nationalism are persistent obstacles to badly needed structural economic reforms and Widodo’s election was seen as the best chance to address these issues. Widodo´s term started promisingly, with the decision to cut costly fuel subsidies in November 2014. However, since then concerns about the government’s willingness and ability to implement further structural reforms have increased. This is also due to some influential Indonesian political and business establishments opposing the reforms, while President ‘Jokowi’ heads only a minority government and needs support of smaller parties in the House of Representatives. The government´s policies have lacked consistency so far, with policies announced and later scrapped while some ministries seem to pass rulings without consulting other government bodies. That said, due to the economic slowdown last year (see below), the government has launched a couple of reforms to revive growth since mid-2015. Among them, deregulatory measures to boost foreign investment and tax reforms for businesses. In September 2015, President Widodo reshuffled his cabinet to speed up government spending on infrastructure projects. Still many industries remain barred from foreign investment, and on a political level, Indonesia´s decentralisation after the end of the authoritarian rule of President Suharto still impedes policy coordination for infrastructure development, often leading to spending inefficiencies. Without more reforms to resolve the structural economic problems, Indonesia´s economic growth rate remains below its potential. While average annual GDP growth rates have been stable around 5.5% since 2000, there are still deep structural problems. Red tape, widespread corruption, a poor legal system, an inflexible labour market and poor infrastructure, keep the growth rate below its potential. Despite the on-going reforms, there are still too many barriers to foreign direct investment (FDI), which is severely hampered by poor infrastructure and limited energy supply. 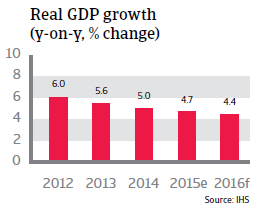 In 2015 weaker domestic consumption, decreased commodity prices and the economic slowdown in China led to lower GDP growth, expected at 4.7%. With continuing rupiah volatility and demand for commodities (especially from China) expected to remain subdued, the 2016 economic growth is forecast at 4.4%. 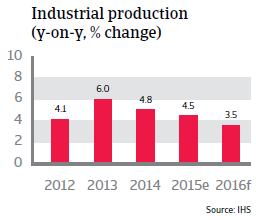 Indonesia´s economic fundamentals remain robust. Government finances are stable, with good solvency. Early 2015 gasoline subsidies were scrapped entirely and subsidies for diesel were capped, taking advantage of decreasing oil prices. This move provided a major relief for the national budget, as in the past the share of those subsidies amounted to around 15% of the total budget. The subsidies cut should allow the government to increase spending on infrastructure improvement, healthcare and education. That said, government finances remain vulnerable to exchange rate risk (43% of debt is denominated in foreign currency) and external refinancing risk (50% is externally financed). Fiscal flexibility remains limited by a narrow tax base of just 16% of GDP. 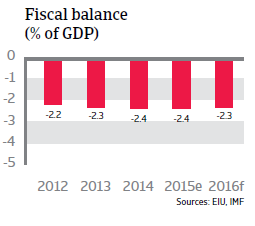 Indonesia´s foreign debt level, currently at about 30% of GDP, remains manageable, although debt service is relatively high. Liquidity is sufficient to cover imports. 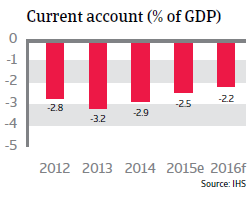 Despite generally sound economic fundamentals, Indonesia’s external position is currently more vulnerable than in the past. This is due to persistent current account deficits and higher private sector external debt, which make the economy susceptible to investment volatility caused by interest rate increases by the US Federal Reserve. In 2013 Indonesia already experienced a massive international capital outflow when the local currency came under pressure, as the US Federal Reserve tapered its bond-buying programme and foreign investors sold off financial assets and shares. However, since then measures have been taken to diminish exchange rate risks with a tighter monetary policy and interventions by the central bank, which has implemented foreign exchange controls in order to reduce dollarization and to stabilise the rupiah. 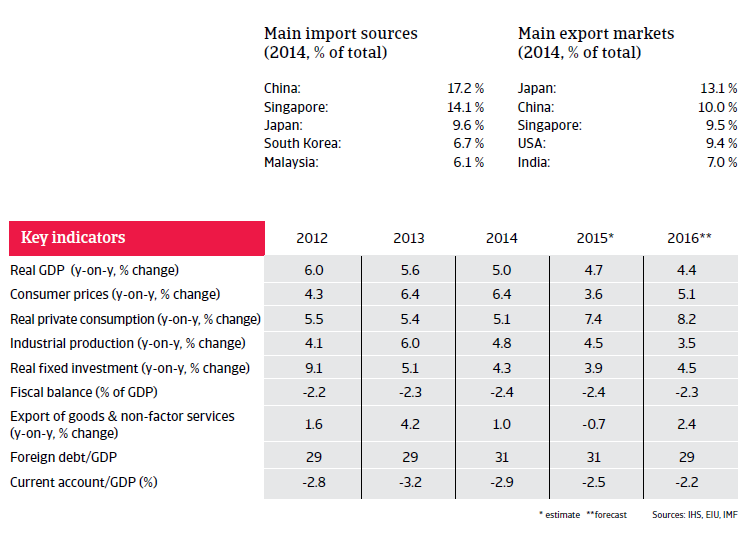 In 2015 the rupiah depreciated 8% year-on-year, far less than the currencies of other commodity exporting countries. The depreciation has some negative effects on the Indonesian economy, as it fuels higher inflation through rising import prices, which hamper the previously promising domestic consumption growth. Downward pressure on the rupiah will most likely persist in 2016 due to the slowdown in China and low commodity prices, which have reduced exports. While the overall economy is generally shielded against major repercussions due to a relatively low foreign debt level and strong access to capital, Indonesian firms are increasingly vulnerable to currency volatility. This is because of their large share of external debt: corporate external debt has more than doubled since 2010 and currently amounts to more than 70% of total exports, the highest such ratio in the world. This increases refinancing risk for firms and their vulnerability to exchange rate depreciation. 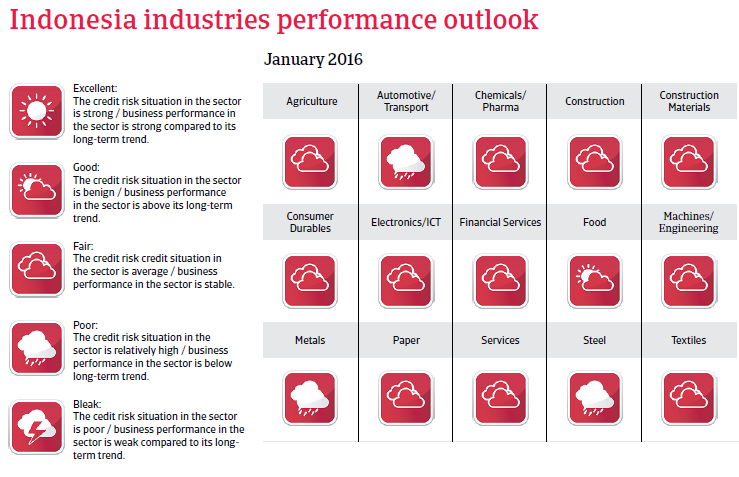 At the same time, the Indonesian banking sector has, thus far, been resilient to the slowdown in economic growth. Non-performing loans are low at around 2.5% and capitalisation is strong, with a capital adequacy ratio (CAR) of more than 20%. 30% of survey respondents in Indonesia reported that payment on domestic B2B invoices is received late due to the formal insolvency of the buyer (respondents in Asia Pacific: 21.4%). The impact of the Chinese stock market crunch of this summer and the renminbi devaluation should not be overestimated. The main long-term risk is an accelerating economic slowdown.